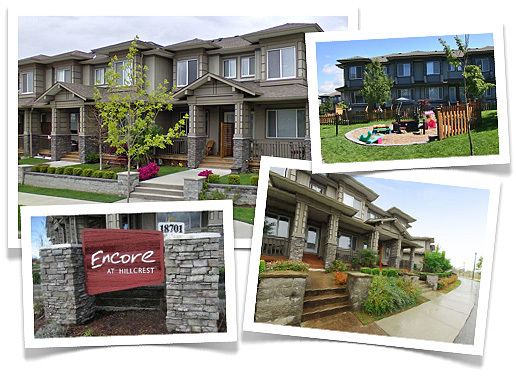 Enter into Encore at Hillcrest from 186th St or 66th Avenue where you will find a 198 unit community that offered buyers over 7 different floor plans to choose from. With 2 and 3 bedroom units offering country style kitchens or open concept great room style floor plans to more traditional separate family room, living room and dining room options. These wood frame built 3 level homes offer main living on the 2nd level and bedrooms on the top floor, with garage at street level. Most units have tandem garage to accommodate 2 vehicles, but there are also double car garage units in some of the end units and single car garage with additional parking out front of a select few units throughout the complex. Each home was pre-wired for security and central vacuum systems. These town homes either have a good sized porch for relaxing on or a fenced backyard for your family’s enjoyment. Homes without backyards have the added benefit of a dual entrance, entrance from the garage level up to the main floor or entrance off the main floor from the street level. Comfortable living extends beyond your front door in Encore at Hillcrest with its sizeable 6380 square foot amenities building. Wide streets are another unique feature not very common in new town house communities today. Two vehicles can easily drive by each other as you travel throughout the complex. Parking is also a plenty if you are having company, either in one of the many visitor’s parking spaces throughout the complex or off the streets of 66th avenue or 186th street.